Using our Impact Team Program, we work with organizations to reveal what it takes to build truly cohesive and effective teams where every member’s personality and behavioral style contributes to the strength of the team. 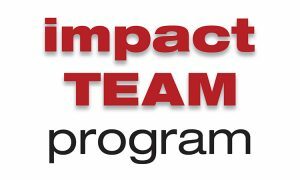 How does the Impact Team Program work? We facilitate workshops for intact teams and work groups to build cohesive teams. We help team members understand how they collectively score on the key components of The Five Behaviors model: trust, conflict, commitment, accountability, and results. Each individual on the team will also understand their own behavioral style and their team members’ styles, as well as how their style contributes to the strengths and challenges of the team. Team members create an action plan to ensure that they are applying the concepts learned during the time together. The action plan and accountability ensures that team members take what they learn with them when they leave the program. We offer a Phase 1 and a Phase 2 Impact Team Program depending on the needs of the team. The impact of this team workshop just might be the best investment you make in the success of your organization. A follow-up session is conducted 3 months after the initial workshop to review action plans and make necessary adjustments to ensure that the individual learning continues and the team is moving in the direction to become more cohesive.